Will fintech and neo-banking be the next frontier for co-working spaces? Beyond traditional banks launching their own digital apps, will it be viable for neobanks to launch with purely new services? By the end of 2016, WeWork has set up more than 100 locations at 35 cities in 10 countries, and now nearly 10,000 companies are based at a WeWork location, with member companies ranging from start-ups to household names including Delta, IBM, KPMG, GE, Dropbox and Samsung. This creates a powerful community that other operators do not offer. On 9th of February, Shanghai studio Linehouse presented how they have transformed a former opium factory with green-painted metalwork and pastel-coloured terrazzo to create the Chinese flagship for co-working company WeWork. 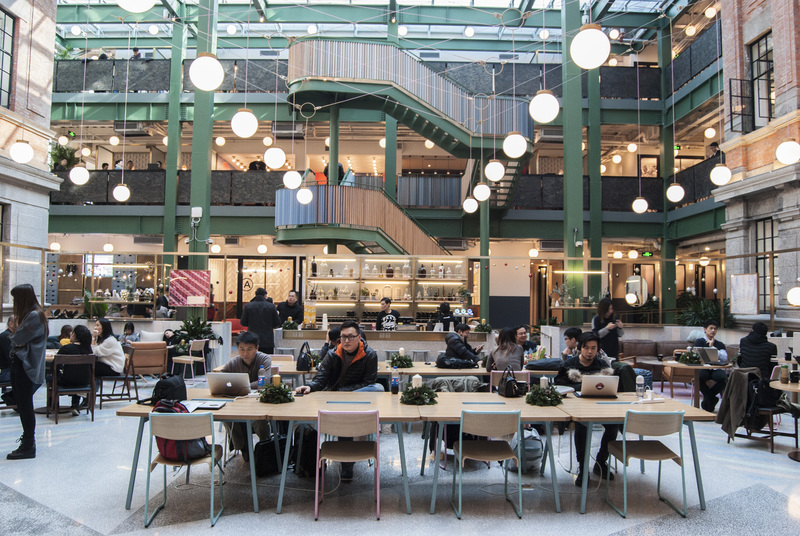 Located in Shanghai’s Jing’An district, the 5,500 square-metre WeWork Weihai hosts more than 1,300 members of WeWork, a co-working company that offers rented desk spaces at relatively low cost, with shared amenities for workers. In China’s context, the thinking behind “Do What You Love” is in alignment with the country’s nationwide campaign of innovation and growing entrepreneurship, said Adam Neumann, CEO and Founder of WeWork. This has helped power WeWork’s rapid expansion in the market. In return, the co-working space operator helps improve productivity and empowers start-up entrepreneurs to reach further heights, he added. Weihai Lu forms part of WeWork’s expansion into China, which it is undertaking in partnership with Sino-Ocean Group. The company has three spaces in Shanghai, with a fourth in the pipeline and another two set for completion in Beijing. 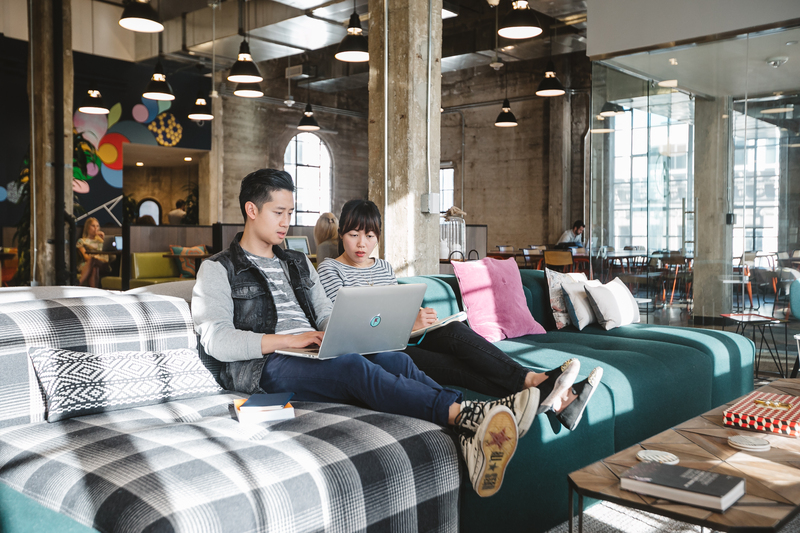 WeWork’s spaces form part of the growing trend for co-working – flexible and communal workspaces – opening around the globe to cater to an increasingly self-employed workforce. At the beginning of the year, the US$17 billion co-working startup leased space in Mumbai, and plans to expand to Bengaluru and New Delhi later this year. WeWork has officially entered the Indian market by leasing nearly 200,000 square feet of workspace in Mumbai. The company, which has been open about its Indian ambitions since last year, will launch a flagship building in India’s startup capital Bengaluru and New Delhi later this year. Also WeWork will become a key anchor tenant at 333 George Street, Sydney, which is owned by the Charter Hall Group’s Prime Office Fund. In October 2016, investors including Shanghai Jin Jiang International Hotels have put another US$260 million in shared-office-space startup WeWork Cos., capping off a funding round that values the company at US$16.9 billion. The latest round, which included a U.S. family office and a mix of new and existing investors, will be used to fund the company’s international expansion, especially to Asia. The company opened a Shanghai office, its first in China, in July. It has also expanded to South Korea and Hong Kong and plans to open locations in other part of Asia. And on 30th of January, SoftBank Group Corp. announced an investment of well over US$1 billion in shared-office space company WeWork Cos., in what could be among the first deals from its new US$100 billion technology fund. While WeWork isn’t a tech company, some of its backers view it as the future of office space and a way to get in on the growing startup economy. WeWork said it had more than 85,000 members renting everything from a shared desk to entire floors of space at the end of 2016, up from around 45,000 at the end of 2015. If an investment were to happen, it would likely push back any public offering for WeWork—which had been considering a 2017 IPO — until at least 2018. It could give the company additional time to show demand for its office space extends well beyond startups. WeWork has also missed some internal targets. Last year, the company acknowledged revenue growth was slower than it had hoped, and it has throttled back plans for WeLive, a division that focuses on dorm-like apartments that was once targeted for very rapid growth. In April 2016 WeWork launched WeLive, a residential rental building that offers flexible renting and a nicely packaged set of amenities. The new program launched for New York (at 110 Wall Street), the same building where WeWork has its main space in the Financial District, as well as DC, a 2221 S. Clark Street in Arlington. The spaces have studios, 1BR, 2BR, 3BR, and 4BR spaces, serving up to eight people, and the studios can come in single bed apartments or two beds to split up the space between roommates. But what’s more interesting is that folks can rent however they want, with the freedom of a month-to-month agreement. With co-working spaces around the world endowing people (sometimes for free) with a place to work, involving vacant areas of schools, hospitals and train stations as new centres of activity, why can’t bank branches, struggling to find their place in digital economy, be a mix of digital banks’ showrooms and co-working spaces for bank customers? Polish IdeaBank, American Umpqua Bank and Italian CheBanca! decided to provide their branches for their SMB-clients as co-working spaces. Also Read: I am running a fintech VC without any finance or PE background – and who cares? We know that freelancers are changing the way we think about work, with their flexible schedules and multiple employers. And we know that freelancing is on the rise. Increasing numbers of skilled professionals are driving the growth of the gig economy (especially, in Asia). In the next 25 years, this shift will accelerate in a major way towards entrepreneurship, independent contracting, and “peer-to-peer” work on platforms like TaskRabbit. Additionally, there will be major diversification of entrepreneurship as new platforms like crowdfunding and relocalized production become increasingly popular. There are now more ways to work remotely than ever before, from devices, apps, and other personal technology that lets us communicate with one another from virtually everywhere. Including banking services. Can co-working extend to fintech? Ask potential customers for money to implement your product/service (crowdfunding). Neobanks and challenger banks raised more than $300M of investments in the last year. An idea of online banks, targeting SMB, has a huge potential too – besides already famous Finnish Holvi and Russian Tochka, new players appear in this area (all of them in Great Britain, for now): Anna, Tide and Civilized Bank. WeWork is attracting 10,000 SMBs as new clients each month – it is much more than any of these neobanks can do. And vice versa, margin per client (and influence to valuation of the company) of neobanks is higher. Banking services (where co-working spaces will be like showrooms for digital bank) looks very complimentary for such kind of customers, which WeWork already attracted. It will be very logical step for development of WeWork’s ecosystem around their customers. And purchase of the one of these player for US$50-200 million can increase revenue and profit of WeWork (and their valuation, too) much higher than price of this acquisition. Further, the idea of fintech banks’ arrival is actively circulating now. That is, if earlier a fintech company used to be sold to traditional banks, that embedded it in its product range, corporate processes and old services’ culture, but now the functionality of fintech companies is strong enough to enable one to construct a fintech bank, consisting only of new services, which would have a client base big enough to compete and earn profit. So, the main question concerning the future of a fintech bank idea is – what is going to be a core of such a bank? What about WeWork?